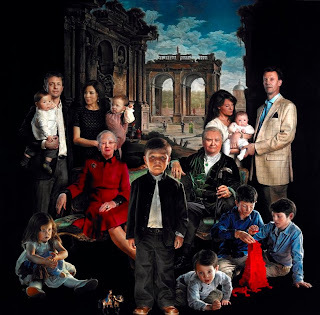 The most striking image to come from the Danish Royal Family this year really divided opinion. A portrait of the entire family together was unveiled in November but its unusual style and bold composition left many viewers less than impressed. The portrait, by Thomas Kluge, is an attempt to follow up the famous family portrait of Christian IX and his descendants by Laurits Tuxen but some reviewers labelled it frightening. The abdication of Beatrix, Queen of the Netherlands was a surprise but not a shock. The pattern for standing aside is well established in the country but Beatrix's appearance on television on the evening of January 28th 2013 to announce she would abdicate in favour of her eldest son and her heir, Willem-Alexander, was still unexpected at that time. Her reign came to an end on the 33rd anniversary of its start, April 30th 2013, when she signed away her realm in a moving ceremony that was as emotional as it was simple. After Willem-Alexander had also signed the instrument of abdication mother and son held hands in a very human gesture at the most important state event of all. The abdication of Albert II, King of the Belgians came as a surprise to many and certainly hadn't been predicted at the start of 2013. Instead, the country began the year by looking forward to the planned celebrations in August for the king's 20th jubilee but on July 3rd 2013 he went on television to tell his fellow citizens that he planned to stand aside in favour of his son on Belgium's National Day, July 21st. The royal household released an image of the king just before his abdication which gave Albert's departure an emotional touch. 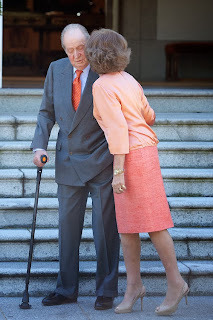 The unexpected, and unusual, sight of a kiss between King Juan Carlos and Queen Sofia caused a stir in September 2013. The king was waiting for the arrival of King Willem-Alexander and Queen Maxima of the Netherlands when his queen surprised everyone by joining him and then planting a kiss on his cheek. There was much speculation as to why Queen Sofia had chosen to show so much affection to her husband in public. It was later reported that around this time the king had discovered he needed another operation on his hip and his wife was offering some comfort almost immediately after the diagnosis. But just days later, rumours swept Spain via social media that the king was about to abdicate. Within hours, the royal household denied this and revealed the king's new health problems. But the picture remained one of the most surprising of 2013. 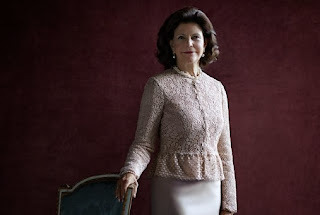 There has been plenty to celebrate for the Swedish monarchy in 2013 and as a result, the country's ruling family has been involved in some of the most memorable royal images of the year. 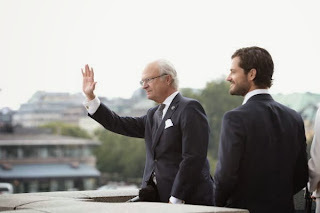 On September 15th 2013, King Carl XVI Gustaf celebrated the fortieth anniversary of his accession to the throne of Sweden and a day of celebrations across the country culminated in dancing in the streets of Stockholm led by the king who earlier toasted the thousands wanting to share the day with him from the top of the Royal Palace. The marriage of Princess Madeleine, fourth in line to the throne, and Chris O'Neill in Stockholm in June 2013 provided some truly beautiful snaps of a truly beautiful royal bride but it was the unusual and dramatic official wedding pictures that were the most memorable. There's only one picture that can top this round up of the best images of the British Royal Family in 2013. After a wait of over a century, and for only the second time in the British monarchy's almost 1000 year history, four generations of monarchs were captured together. 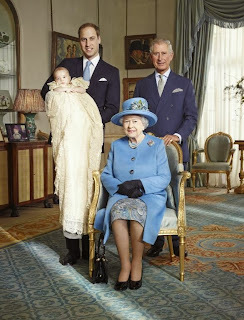 The christening photo of Prince George of Cambridge with his great grandmother, Elizabeth II, his grandfather, Charles, Prince of Wales and his father, William, Duke of Cambridge is one for the history books. Europe's royals have had a busy year. But when the dust settles and the ink dries on the history books, 2013 will be remembered for the arrival of a future king and the departure of two monarchs. The impending birth of the Duke and Duchess of Cambridge's baby was known about as the year began but the abdications of Beatrix of the Netherlands and Albert II of the Belgians were both unexpected in their own ways and changed the royal landscape of Europe rapidly and decisively. 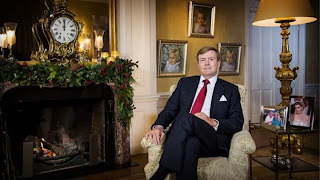 Pictures speak louder than words, goes the saying, and the image given by a first glance at the Christmas Day speeches of Europe's monarchs certainly provides an interesting impression of how they see themselves and how they want to be seen. Most striking was the background to the speech given by the new king of the Netherands, Willem-Alexander. While the comfy if imposing chair was to be expected, the new monarch put himself firmly at the centre of his country's royal family with the pictures he displayed around himself. Most prominent were the three portraits of his daughters on a wall behind him, a reminder of the future of the monarchy he now rules. But to his side was a photograph of his wife, Queen Maxima, and another of his parents, Princess Beatrix and Prince Claus. 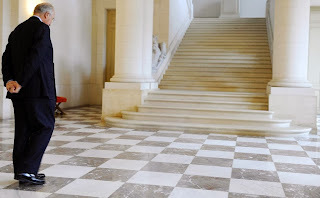 The new king looked forward and back while placing himself firmly in the centre of the royal household.